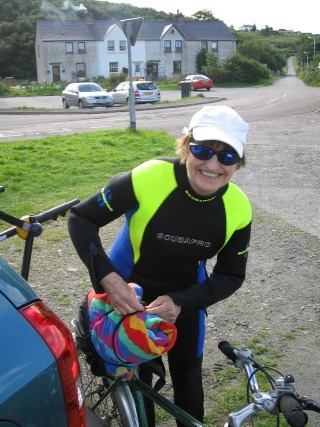 In this inspirational retirement travel story, by Nicolette Scourse, we see that age, or reduced mobility need not be a barrier to adventure travel and wild encounters. The only limits are your desire and imagination. As a biologist, aged 30 and familiar with text book fish illustrations from the 1950s and 60s, it was impossible not to grin like a pantomime Cheshire cat. 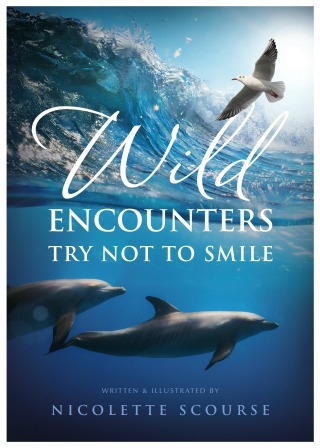 My travels to encounter animals, people, beaches and seas in wild places had begun. My new found passion had to lie dormant until 22 years later. I first circumnavigated a Maldivian island in the Indian Ocean... swimming with a mask that fitted and trying to keep a straight face. The encircling reef of the island dropped away sharply and coral was knobbly, battered by waves and storms. Corals and sponges were tight packed holding the reef together. Not a gap remained unfilled, a jumble of colours, shapes and textures reflecting the intense competition for living space. In dark cracks some recognisable animals scuttled and crept – multi-legged worms, crabs and near transparent shrimps on threadlike legs. Sea urchins moved slowly, threatening balls of dark spines, sliding and gliding on tube feet. Many reef occupants have no recognisable terrestrial counterparts at all as it is only under the sea that one can see representatives of all of the different animal body designs that have survived extinction. By contrast on land there are less than half. In the main ‘swimway’ beyond the reef edge, line upon line of fast swimming, bright silvery fusiliers sped towards me - over 200 of them, dazzling blue, iridescent, vacuuming up food with ultimate efficiency. Following them along the reef edge was like flying over city streets – looking down into apartment windows at scenes of communal living, partnership, courtship, deception, stealth and aggression. Far down, the cliff face gradually blurred into deeper distance where bigger fish shapes disappeared into opaque blue. Sometimes a turtle swam below, flapping front flippers in slow motion. In open water above big flat-topped corals animals of incompatible sizes gathered, queuing at cleaning stations waiting for attention from the resident ‘dentists/hygienists’. With disbelief I watched as enormous fish opened disproportionately large mouths, projecting their jaws forwards and outwards while tiny fish darted in and wriggled deep inside and Cleaner Shrimp slowly teetered in on robotic jointed legs. Where there are deals there are double dealers. There are fish in disguise which behave like the dentist but with client in position, bite out a chunk of living flesh. 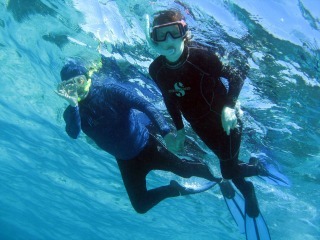 Without wetsuits, we habitually snorkelled wearing thick woolly tights (an attempt at sun protection). With patches of skin exposed through random small holes we obviously bore some resemblance to dark fish heavily infested with pale parasites. We regularly felt tiny nips taking skin morsels – was it the genuine cleaner or the mimic? One does not have to swim under the sea to have such wild encounters. Many creatures of the sea come ashore to rest and breed - turtles, seals, sea lions and multitudes of seabirds. Their fascinating everyday lives and relationships can be seen without ever getting one’s feet wet - from boats, cliff tops, dunes and beaches, even car parks. The only prerequisite for your retirement travel story is patience, to be quiet, even furtive, and most importantly not to encroach or intrude into their wild space. Binoculars would be useful, and in northern climes, probably a rain jacket and wellingtons. Oh, and a sunhat. 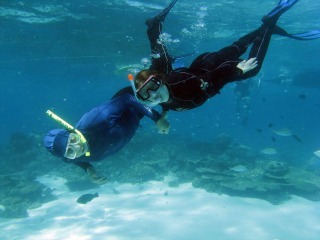 No need for a wetsuit... or woolly tights, but if using a mask for a rock pool... try not to smile! Nicolette Scourse was brought up in Australia where wildlife and beaches became part of her life; ever since she has passed on her passion for animals and plants in wild places through lecturing, teaching, writing and creating ceramics.